Glamourhas redesigned its website to prioritize mobile users, led by editor-in-chief Samantha Barry. This follows publisher Condé Nast’s announcement in November that it would no longer regularly publish a print edition. The changes are part of Barry’s focus on a digital-first strategy for Glamour, especially to improve the site's mobile experience. Mobile audiences drive 85% of web traffic to Glamour, according to Condé Nast. The design makes it easier to swipe and slide through content on a mobile device. Barry is a digital journalist who replaced longtime editor Cindi Leive last year. The flexible and updated homepage allows for more stories to be visible above the fold, including multimedia content like videos, podcasts and product recommendations. The new site delivers a native ad experience with in-context branded units. Glamour is also introducing vertical galleries. Users can swipe up or scroll through, rather than click page by page through images. In initial audience testing, engagement on the new galleries grew 10%, according to Condé Nast. 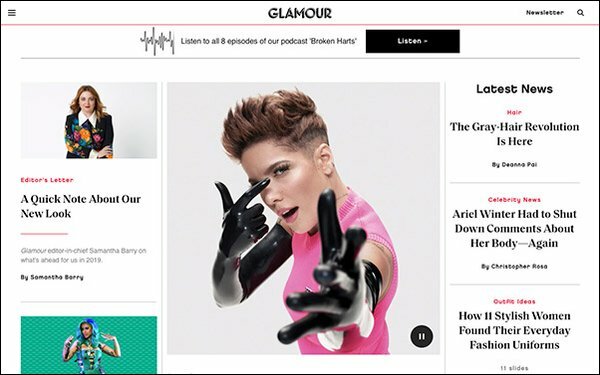 Timed to the relaunch of the website, Glamour unveiled its first digital cover of 2019, featuring singer-songwriter Halsey. The redesigned site showcases her feature story with an animated cover, photo spread and video. In a year under Barry, Glamour says monthly unique viewers grew to 6.3 million, up 12% at the end of 2018. Its YouTube channel subscribers increased to 1.6 million, up more than 110%. Condé Nast also shut down the print publication of Teen Vogue a little over a year ago in an effort to cut costs. The publisher recently announced it will put all of its titles behind paywalls in some capacity by the end of this year.